Veterans' Memorial School will respect students and respect each other focusing on their strengths and capacities, leading to their high self-esteem. We will strive to meet all of our students' academic, emotional and physical needs in a caring school environment. The Veterans' Memorial School experience will instill in its students a life-long love of learning and such values as honesty, diversity, respect, and compassion for others. After 30 years of teaching, Janet Allen has decided to begin yet another chapter in her life. That being one of retirement! After raising 3 daughters with her husband Jim, Janet went back to college and earned her teaching certificate. She started out as a substitute teacher, and then a private school teacher. Eventually she got a job at the Veterans’ Memorial Elementary where she stayed for last 24 years as a kindergarten teacher. She thoroughly enjoyed working with 5 year olds! In fact, she said that, “It will be hard to leave teaching because of the children.” She loved them as well as the wonderful staff and parents. Her decision to retire was a difficult one. As she begins this new chapter, she looks forward to traveling not only to see her daughters and 5 grandchildren spread out between Seattle, WA, Alexandria, VA and Groveland, MA, but also to Hawaii, Disney World and hopefully Cuba. The entire Veterans’ community, wish Janet a healthy and long retirement filled with love, adventure and fun! The 5th graders put on their annual Was Museum the week before April Vacation. They were inspirational to all future 5th graders! Their performances were a credit to their hard work and dedication of their teachers. A great big "Thank You" goes out to the students and 5th grade team of teachers!! Hot Dog Bingo was a GREAT SUCCESS! Fun was had by all!! Thanks to all who participated. We hope you enjoyed yourselves!! 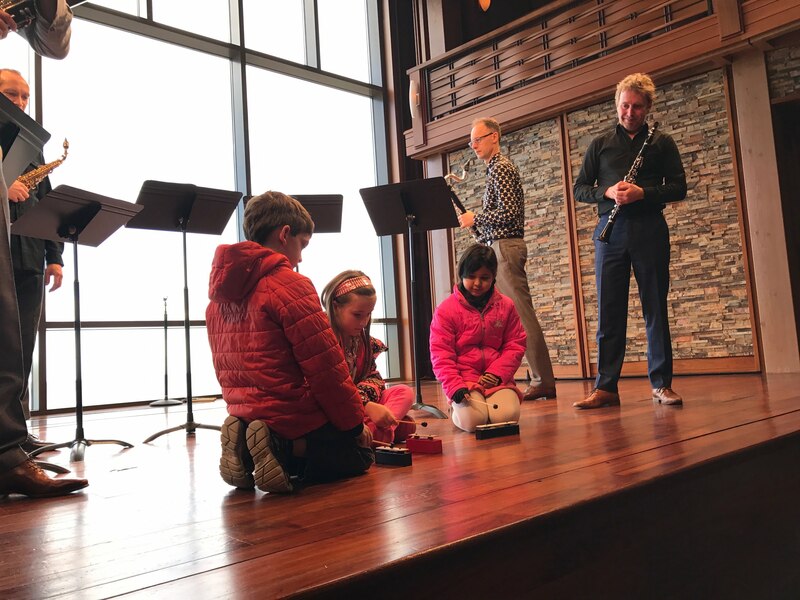 The 3rd and 4th graders attended a reed quintet performance at the Shalin Liu Theater in Rockport. The reed quintet came from the Netherlands and demonstrated several reed instruments as well as performed several selections written for reed instruments. Below, Logan Williams, Ava Hovis, and Isabel Luiz accompany the quintet with the background beat. Under the direction of Ms. Smith and Ms Hosman, the Veterans' School has begun a composting project. Immediately after every lunch, leftover compostable food is composted. The children have been instructed as to what can and cannot be composted through a Monday Morning Meeting discussion and through individual class instruction. The project will last all year long. Responsibilities for collecting food is slowly being released to the children. ERAH Awards were given out this month. The Everyone Reads At Home Award is a volunteer, yet highly encouraged, reading at home program. Children have a log that needs to be filled out by their parents to demonstrate that they have read, or in some instances, they were read too. Congratulations to all those who participated. Thank you parents for your support. Adrianna Lopez held the first ever bilingual informational night at Veterans' Memorial. The Hula Hoop Club has begun its second session at Veterans'! Children in grades 3-5 can experience the fun of hooping while socializing with new and old friends Wednesday afternoons. These students performed alongside the Boston Hoop Troop at an assembly earlier this month. They did a fantastic job! Congratulations students!! Kindergartener Laney Morais came to school Thursday, November 4, in a Gloucester Fire Truck. Lt. Dominic Barbagallo of the Gloucester Fire Department, helped facilitate the ride to school for Laney and her Dad. She arrived with horns blazing and children wishing they were the winners. Maybe next time! The Writing Club continues at Veterans'. Children from grades 3-5 work creatively while honing their writing and typing skills. Topics are decided by the children and collaboration is encouraged. They meet Tuesdays after school. The Summer Reading program was met with great enthusiasm as more than half of the school participated. Jayla, from Ms. Clayton's 4th grade, is seen admiring the more than 90 dioramas set up in the library. The Wrapping Paper Fund Raiser was a huge success with over $6500 dollars raised! Nicholas, from Mrs. Favaloro's 1st grade class, raised over $600 dollars alone! Showing 3 files from page Documents.